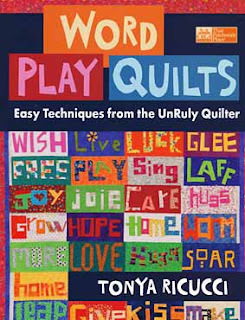 In honor of the release of the Unruly Quilters new book Word Play Quilts, December 7th has been 'officially' declared "International Tonya Ricucci Day." Under her former covert code name of LazyGal Tonya, Tonya Ricucci is the guerrilla commander of the underground "Alphabet Liberation Front." Clad in wild shirts, with a cat under each arm (and one wrapped in a quilt), Tonya is the one who opened the doors to the releasing of the entire ABC Nation. Single handedly, with the cheering on of Queen Bonnie of Quiltville and the lovely lady, Clare...Duchess of Dordogne, (and her ladies in waiting, too numerous to count), she freed first the Upper Case, and then the Lower Case, and then...the period, the comma, the question mark, and the exclamation point! "Free at last, free at last" the untethered letters proclaimed. They jumped off their perfectly cut and perfectly lined foolscap and off into uncut, and unlined horizons. Once the horizon was changed, even the liberated stars began to fall out of alignment....and the escaping celestial chords began to chime to a different key, and in a new and full array of rainbow brite colors.....the quilting world was forever changed, once more. The stars and the Asterisks, the houses and the Wonkytowns, and the amazing holidays..Halloween, Hallowistmas, and Christmas and everything, and everybody, began to march to a different drummer. We began to sew with a different palette and the rainbows opened up in the sky and the tones, and the hues began to warm up....and and then suddenly....the color orange became the new neutral. Tonya had it all sewn up in a bag and the bag was a gift to the liberated who were pointless, and hoopless, and out of line, at last. LazyLady Tonya wasn't lazy anymore. NewandVeryBusyLady Tonya began to create a new vision. One that did not involve jumping through hoops, or even quilting with one, for anybody. The now proclaimed, UnrulyOne, not only gave us the UnRuly Piecing Basics but as her ladies staggered into uneven formation, the Liberation Front was filled with H-O-P-E once more. Quilters had a cause and a be-cause at last. Hoopless, but not hapless, she showed up in our Houses, our Homes even our Pantry and it was she, who made ugly fun again. She took a leap and a bound, and began her plan of a 2010 Liberation of the Amish. One by one, we began ripping off our perfect points and we burned them in the cataclysmic fires of the future of freedom. Looking disdainfully at the meeting of great seams, we knocked them all wonky and askew. "Woo Hoo!" we hollered, as the Wonky Women united. We built wonky houses, and wonky villages, wonky forests that hid the wonky trees, wonky cats and dogs,wonky butterflies and birds, wonky flowers and fish. Our own imaginations ignited, and we set off on our own paths of creative de- and re- construction. It didn't matter if we could free-piece letters. It didn't matter if we couldn't immediately let go of the rules and regulations. What mattered is we now knew we didn't have to play by any rules. We just were given permission to play ,? ; : and !. Thanks Tonya! For all you did for the Liberation of the Alphabet Nation, your creation of the Liberated Front, and for your inspiration for today's Word Play fun! "How did Tonya, personally inspire each of you?" I became a Wonky Woman and a Happy Free-Piecing Fool. 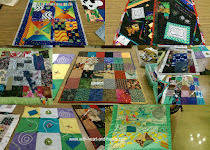 I was inspired by her AAQI HOPE Challenge, to create the AAQI Liberated Quilting Challenge and invited by Clare to co-moderate Tonya's blog Liberated Quilting. 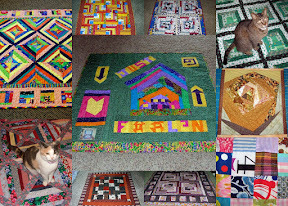 I was inspired to collect, and to create, the first Liberated Quilting: Blocks, Letters, Patterns and Tutorials list. Thanks for all of the cat hair Tonya. Thanks for the extra hours in my sewing room, the huge mess on the sewing room floor, and for the husband who now wonders if I am ever coming downstairs again. I say this with tons of musical notes.. Can you hear me? Michele - you've surpassed yourself. This is a fabulous post - I could hear all the Rules cracking and finally breaking into pieces as I read it! OMG...me and my bio-magnetic, electric personality. This was scheduled to post tomorrow, Dec. 7th...the official Tonya Ricucci Day...but it published ONE WHOLE DAY early. So, now...my cat is out of Tonya's Gift Bag...and I am the playing one day early. I didn't want to mess up Sujata's or Clare of Dordogne's comments. Thanks for commenting ladies or I would never have known what I'd done. Michele...pointless,clueless, and always out of line!!! LoL.. Still laughing! What fun! Why wait for celebration..GO TONYA! MIchel - I swear to goodness that you are going to be the death of me. Just be very careful with that bio magnetic personality of yours! Oh, dear! You've reminded me of the Christmas quilty I started a couple of years ago. I think everyone else finished, but mine is in a bag abandoned and alone! What a wonderful post! Amazon is already selling the book, so maybe your post knew something you didn't! Official Disclaimer: If I become the "Death of Clare, yet" then I have to have an 'International Clare Worthy, Duchess of Dordogne" Day. And I will know, for sure, that it was not me who dunnit!!! I am a big fan of Tonya's blog and am quite intrigued with her techniques. However, I have not yet taken the first step... These things must be handled delicately. I'm going to be taking baby steps. Thanks for the giggle Michele! I found your blog because Carol had you as her "Monday Hero"......I've signed on as a follower and look forward to reading your posts. WOW! What a terrific post! I echo every sentiment. Tonya has changed the course of my quilting life! I'm thrilled! This was so fun! LOVE IT! I love how Tonya has brought out so much good in so many of us! Thanks, Michele for all YOU do! that did it. between you and Clare you've made me cry. thank you. happy ITRD! I'm raising my glass of chocolate almond milk! Michele, when is your book coming out? Great writing--I couldn't have said it better (ha ha).We're a bunch of happy quilters today. Ha.... tears of joy from Tonya! Tonya has released me to put words or letters anywhere I want! Michele, thanks for your lovely words of Congratulations to Tonya. 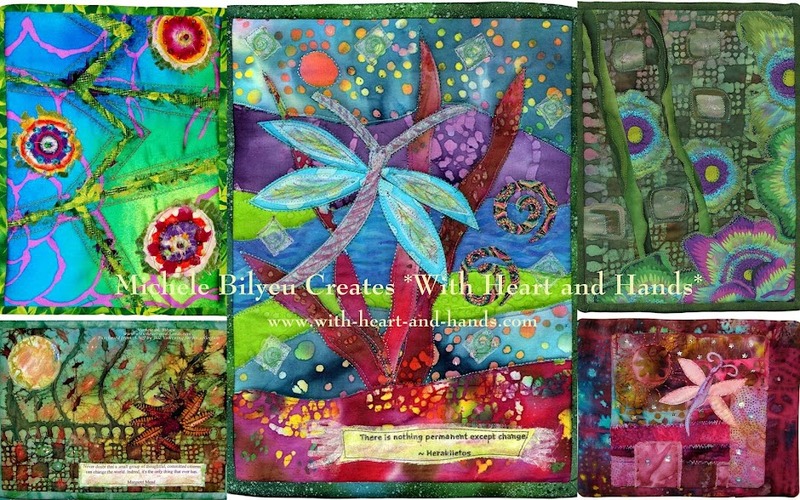 I found her blog several years ago but didn't give words a try until our wonderful Lib-Quilters group. So I've been inspired by Tonya and by you, Clare and the members of Lib-Quilters. 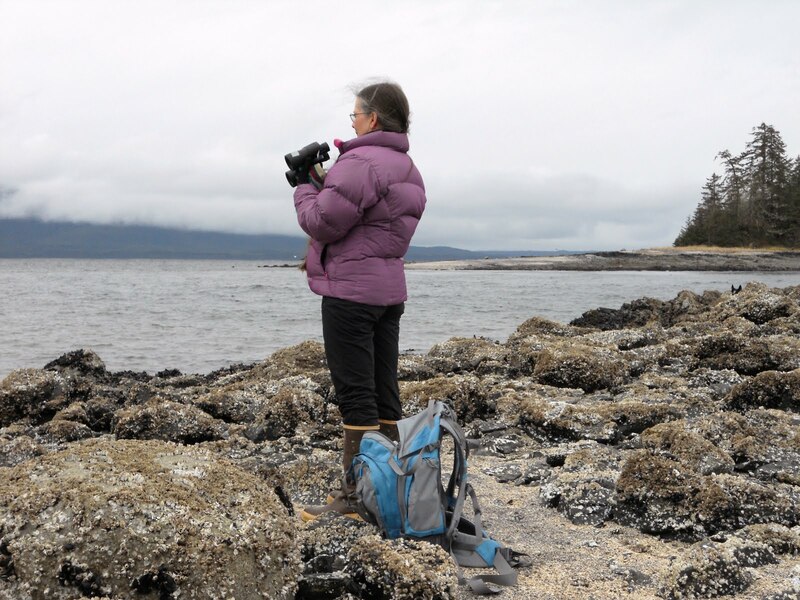 Your blog posts are always, always my favorite of all in blogland. always loved seeing her work and watching the progress of quiltmaking thru the years. And this is why I blog, to visit you and be filled with joy, smiles, friendship, celebration of all that makes a heart giggle! What a tribute to dear Tonya!!! What more can I say but "Ditto" to what everyone else has commented. You've just cracked me up! Wonderful post - just great! Yay! for Tonya. She's changed my quilting life too. Here's to more words on quilts and Wonky Women!